Marriott Rewards members can earn 5,000 bonus points + other extras by booking a specific rate and staying at the Renaissance Paris Vendome hotel by June 30, 2014. Seems that there are two offers with very similar package. One expires on June 30 and the other one on May 18. You can access Marriott’s web page for the June 30 ending offer here. You must book this offer using M11 promotional code. You can get a rate calendar for M11 that shows the prices and availability for a month period. The rate under this offer is actually a lot expensive that the member exclusive offer that has the same benefits, but ends sooner. Marriott truly has unlimited number of this bonus points offer for hotel stays with different extras bundled in. You should always compare all the rates and book the one that suits you best. Guest must book reservation using promotional code listed above in order to receive bonus points. Back to back stays are considered one (1) stay. Offer applies to one regular room per stay, per member, based on double occupancy on dates listed. A “hotel stay” or “stay” means all consecutive nights spent with Marriott by a registered Marriott Rewards member. Offer not available during special events; tax is additional; special offers cannot be combined; blackout dates may exist; advance reservations are required. 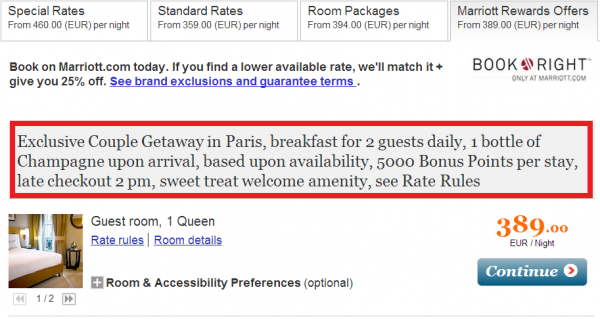 Offer does not apply to groups of 10 or more rooms. Members electing to earn miles are not eligible for this promotion.